The best part however is our terrace. Join us for a yoga session in the morning, a relaxing siesta in the afternoon, or a cold drink at night! With great views and amazing weather, there are few places in Cádiz with as much charm as here! We also like to set ourselves apart by having a staff that are welcoming and friendly trying to do everything we can to make your stay more enjoyable. The location is frankly unbeatable. With a 10 minute walk to the beach, 7 minutes from the bus/ train station, 5 minutes from the cathedral, 2 minutes to the town hall and literally right in front of a michelin star restaurant, you have everything at your fingertips. Apart, we happen to be in one of the original and oldest neighbourhoods (making it quite old) with amazing local cuisine, historic monuments and authentic flamenco shows just a hop around the corner. We offer a recently reformed studio apartment with kitchen, private bath and European style balcony. We have comfortable queen mattress and everything you need to enjoy a pleasant stay. You also have access to a shared terrace on the roof with amazing views! I was only in Cadiz for a couple of days for NYE but I really enjoyed my stay at the Spanish Galleon. Staff was extremely friendly and accommodating during my visit. The private room that I had was cozy, comfortable, and a great value for the price. I would recommend this hostel to other travelers that are stopping through Cadiz. Location is great as well in the old part of town and easy walking access to bars, restaurants, and shopping. Great city, location, staff, facilities, and there's an incredible terraza looking out over the whole city! Fantastic hostel, and if I'm back in Cadiz I'll be coming back here! Super clean. Nice upstairs terrace. Kind and helpful staff!!!!! Best location ever. Only con: my back despised the memory foam mattress. Nice place with great staff. Totally worth to recommend ! We couldn't have asked for anything more from this hotel. Lovely room, excellent location and very helpful staff who gave us some top recommendations for places to eat and drink. We would gladly stay here again. Great value for money. A very good place to stay, there is a nice terrace and staff are helpful. Location is very good, near the train / bus station. Lovely hostel with friendly staff. Downside is that there is no indoor common area (there is a rooftop one) but thats a relatively minor issue. 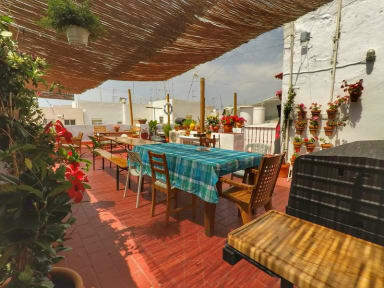 A great option for a bargain stay in central Cadiz. The staff couldn't be more helpful and friendly, and the roof terrace is a real asset when you need a quiet place to relax. 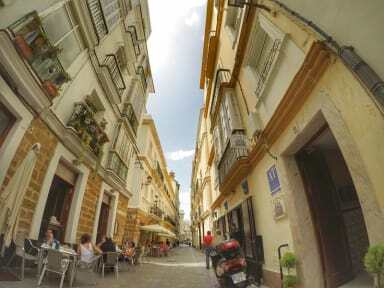 Wonderful, little upstairs hostel in the heart of Cadiz's old town. Great, friendly, kind, attentative staff with some knowledge of the area and places to eat/drink and city attractions. free machine coffee/tea available. No breakfast and no kitchen, very small reception and only one small bench for seating. Shower holder broken, but staff were informed, so probably fixed now. 42Euros for private room with double bed, bathroom not in room. Staff make the atmosphere, would definately stay again.